Where and How to Bet The Masters With Bitcoin in 2019 - Best Odds! Our Newbies Guide To Bet on the Masters 2019 – Get a little skin in the game at our top betting sites! If you are a golf fanatic, you already know this, but those who are more casual, or even new to the game should know that the PGA Masters are coming up fast! “The Masters” is part of a 4 part event known collectively as “The Majors” along with the US Open, the Open Championship, and the PGA Championship, with The Masters being the first of the “Big Four”. Always played at the Augusta National Golf Club in Augusta, Georgia, the Southern links will see the pros swinging their clubs around starting on April 11th until the 14th this year. Some other information you need to know is simply how to get started betting on the Masters. Other things we’re going to share with you are the current odds for the year as well as where to find the best promotions for your online wagering. Last part of the boring stuff, if you are a bitcoin user, or any other crypto, we want to turn you on to some of the more legit bitcoin sites for betting on the Masters or anything else that you feel like gambling on. And with all of that out of the way, let’s get to it! As we will discuss again a little further down the page, always make sure to do your homework on the stats of all players as they get updated. Patrick Reed is last years winner but is currently a little ways away from that coveted top spot! Bovada – Visa/Mastercard/Amex for fast deposits. Also accepted are bitcoin, bitcoin cash and Chase Quickpay. To see a full, honest review of Bovada, click on this link. BookMaker – You can use 60+ crypto currencies including bitcoin to make a deposit with Bookmaker, they’re obviously very crypto friendly. They set the lines and are one of the most respected books in the industry. Click here to see their full review. Intertops – 20+ years of online bets at Intertops. Use Bitcoin and Bitcoin Cash here along with 4 other types of crypto. Also accepted are Visa and 7 other options such as Bank Wire and others. And as we’re sure you have guessed, you can click here for their full review! But GoodSports, of course you think all those sites are good, you’re in it for the money! Actually, not 100% true. We like money, sure, but we are proud of our honesty. You can click here to see all of our reviews and you’ll notice that we love some sites and sometimes we’ll say, don’t send these guys any money! Here are the current odds on the Masters 2019 as reported by Bovada. Scroll past this list to see our top recommended betting sites for the tournament. These odds constantly change, see link above for latest odds and we’ll do our best to update as needed. The specifics of what to expect when betting on the Masters will vary depending on the participants, the weather, and other factors. But there are some things that you can keep in mind because one thing hasn’t changed, and that is the course. Like any other course, it favors some players and not others. Measuring around 7,500 yards, this course lends advantage to anyone who can take long shots off the tee. Be wary of pin positions on the greens. They’re made to be especially tricky. The placement of the greens relative to the fairways gives edge to golfers who excel at scrambling. Back players that do well right away. Some players can get a weak start on other courses and catch up at the end, but it’s very difficult to do at Augusta. Players that do well at drawing the ball will find that they are a natural fit for this course. Those good at fading the ball may struggle. There are trends to be aware of. First, it’s very rare for a Masters debutante to win. Secondly, someone returning to the Masters after failing to make the cut previously probably will not win. Tiger Woods did it, but nobody else between 1980 and 2015. Watch out for golfers who aren’t in form. There are number of automatic invites to the Masters. There’s no requirement that these golfers be on top of their game in order to appear. This may sometimes tempt out-of-form golfers to show up. So pay attention not to their past performance, but also the form they are in right now. Remember, this is a starting point for your strategies. You’ll need to look over data for golfers appearing and apply your own systems and analysis in order to make accurate predictions. Still our top choice for PGA Tournament wagers! 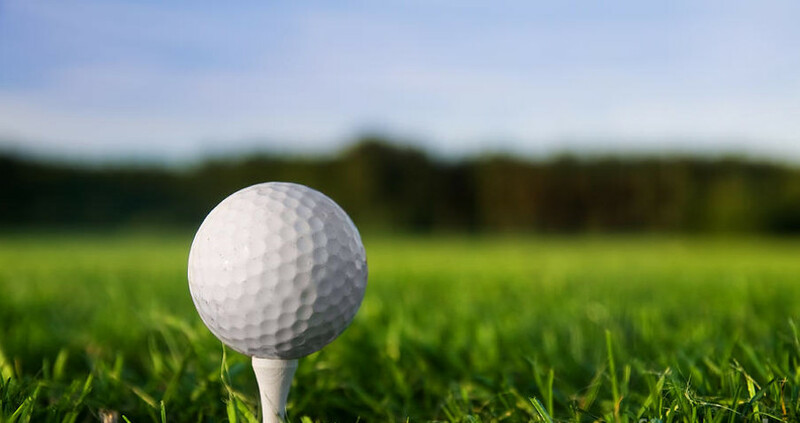 Now that you know about the history and format for the Masters, and have had a chance to look over the odds for this year’s tournament, let’s check out the top recommended websites where you can place your bets. 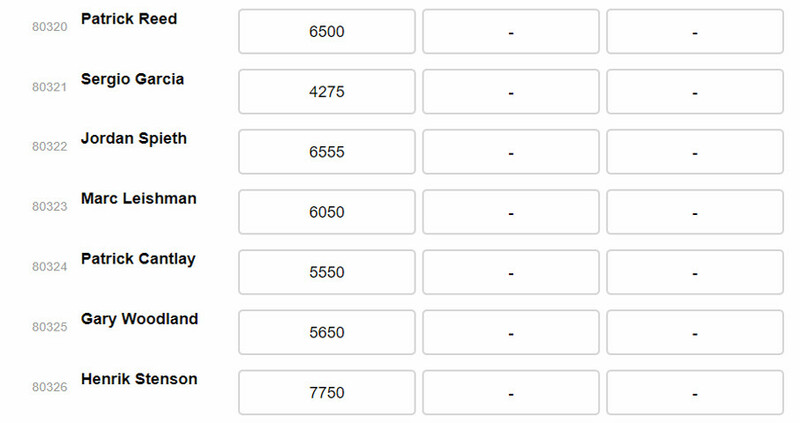 Bovada offers golf futures on the US Masters 2019, which means you can actually place a bet on who you think the winner will be right now. There is a $250 welcome bonus to all new sports betting customers right now, so this is a great time to sign up and take advantage of that offer. 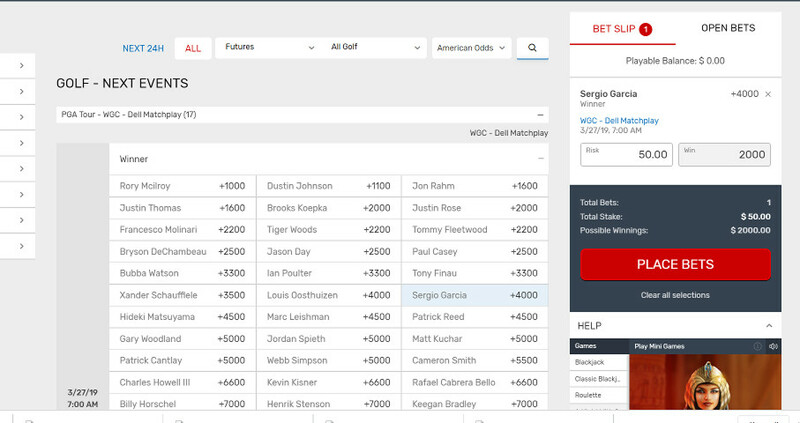 This is what it would look like if you were to go to Bovada and wager on Sergio Garcia to win on the morning of the 27th at the Dell Matchplay. You’ll notice that with the current odds, I’d get a nice return of $2000 on my original $50 wager. Another of our favorite sports betting sites to offer action on the Masters in 2019 is Intertops. On this site, you can place outright bets on the tournament. If you sign up now, you can get a $200 bonus. GT Bets allows you to bet on the Masters as well as the other Majors. Along with outright bets to win, the site allows you to place futures bets as well as proposition bets. When you sign up, you can get a 100% match bonus on your first deposit up to $500. With your second deposit, you can get a 50% match up to $500. The site offers additional reload bonuses and rewards as well, making it a great site to wager on golf throughout the year. Over at BookMaker, you can bet on the Masters and take advantage of a massive deposit bonus of up to $2,500. This is an outstanding offer for the high rollers out there. We also recommend this site to those who are looking for a large assortment of proposition bets. This is what the betting slip at BookMaker looks like while I type this. You’ll notice that their odds for Mr. Sergio Garcia are slightly different. This is why it’s good to join more than one Sportsbook, so you can shop for the best odds! On 5Dimes, you can place outright bets to win, as well as prop bets on the Masters and other Majors. In terms of rewards, you can get reduced juice on golf as well as other sports. Just be aware that this promotion is usually for bets that you place on the same day as the event, not for futures. 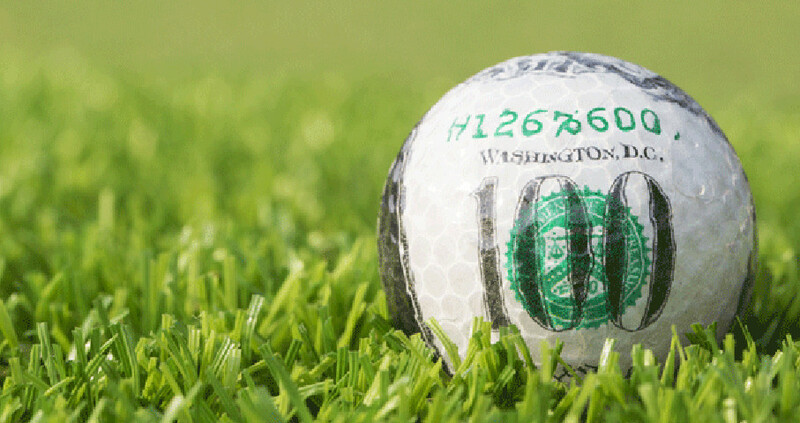 Like any other sport, Golf has many, many different types of wagers you can make. Follow your style and just make it fun for you! There are a number of different types of bets which you can place on the Masters. The exact types of wagers available will depend on the sports betting site you choose to use. Here are some common bets available. This is the simplest and most straightforward type of bet you can place on the tournament. Simply try to predict which player will win the green jacket. Try and figure out which player will be in the lead after the first round is complete. Don’t feel comfortable trying to figure out who will win the tournament altogether? If you believe that one player will outperform another, you can place a match bet. If you are right, you win, even if the player does not place well overall. There is a strong tradition of amateur play at the Masters. For this reason, many sportsbooks also will allow you to wager on which amateur player will rank the highest, regardless of whether that player wins the tournament or not. There are a whole range of prop bets available for the Masters. For example, you might bet that a particular golfer will make a hole-in-one on a particular hole. Or you might predict that the winner of the tournament will be a rookie. You also can wager on what country the winner will be from. The more betting sites you join, the more types of bets will be available to you. This also will give you a chance to look for the best odds on the Masters. When is The Masters Scheduled for 2019? The 2019 Masters are scheduled to take place from Thursday, April 11th, 2019 – Sunday, April 14th, 2019. As always, the tournament will be held at Augusta National Golf Club. In case you are wondering, it costs more than $4,000 on average to purchase tickets for all four days of the Masters. If all you want is a ticket to the practice session on Monday, you may be able to get a ticket for that for under $500. For that reason, it makes a lot more sense for most golf fans to watch the tournament online or on TV, and to place bets online. Where Can You Watch the Masters in 2019? CBS Sports Network and ESPN have the rights to broadcast the Masters this year on television and radio. You can view the schedule here. If you do not have a cable subscription, try using Sling TV plus CBS All Access. The Masters has been played for decades, and has always taken place in Augusta. It all began in the 1930s when amateur golf champion Bobby Jones teamed up with investment dealer named Clifford Roberts. Together, the two worked to create and administrate the Augusta National Golf Club (Alister MacKenzie worked with Jones on the course design). The very first Masters tournament took place in 1934. That year, the victor was Horton Smith, who won $1,500. During that first match, the course was played in a different order. The holes which currently are played as the second nine were played as the first nine, and vice versa. The order was switched the next year, and has remained that way ever since. While a number of changes have been made to the course over the decades, some traditions have remained intact for most of the tournament’s history. Most prominently, there is a green jacket which each champion dons upon winning. This tradition has been in place since 1949. There is also a famous Champions Dinner, which is always held on the Tuesday preceding each year’s tournament. This has taken place since 1952. Since the early days of the Masters, the prize pool has grown considerably. The 2017 winner, Sergio Garcia, took home $1,980,000. The golfer with the most wins under his belt is Jack Nicklaus (six in all), followed by Tiger Woods and Arnold Palmer (who each have won four times). Out of all of the Majors, the Masters is the one with the smallest field of players. The tournament is invitation-only, but anyone who wins is allowed to return to future events any time they wish. Other golfers who get invited are those who are in the top 50 in the international rankings, have won in any of the other Majors over the past five years, or were in the top 12 for the Masters last year. There are also additional US and international participants who have placed high in other tournaments over the past year. In all, the Masters comprises four rounds played across an 18-hole course, for a total of 72 holes. They always takes place starting on Thursday and running through Sunday, with players contending in groups of three for the first couple of rounds. After this, only players who rank in the top 50 or who have scores within 10 strokes of that of the player currently leading are allowed to continue. Generally, a winner will emerge during the fourth round. If this does not happen, the winner is decided by sudden death. In short, every year the Masters presents one of the most exciting betting opportunities in the world of golf. There is still time to plan your bets for this year’s tournament, so sign up on some of these recommended sites to take advantage of their excellent odds and promotions. And finally, good luck wagering on the Masters 2019!